Nixon's big day fell on a Tuesday. He started off the day with a few presents before school. As far back as I can remember, Nixon has been really into dogs. The truth is...I'm just not a dog person. But years ago, I told him when he turned seven we could get a dog. I said that thinking, "surely he'll be over dogs by then". And in some ways he has because now he's into sports, but deep down his love for dogs remains. So-I'm panicked because he just turned six! haha! Ebby Lee and Bowen each chose him a toy for his birthday. That night the real party started. He asked for a couple friends to go bowling and eat dinner at the bowling alley. Nixon is always my easiest kid for gift giving and birthdays. 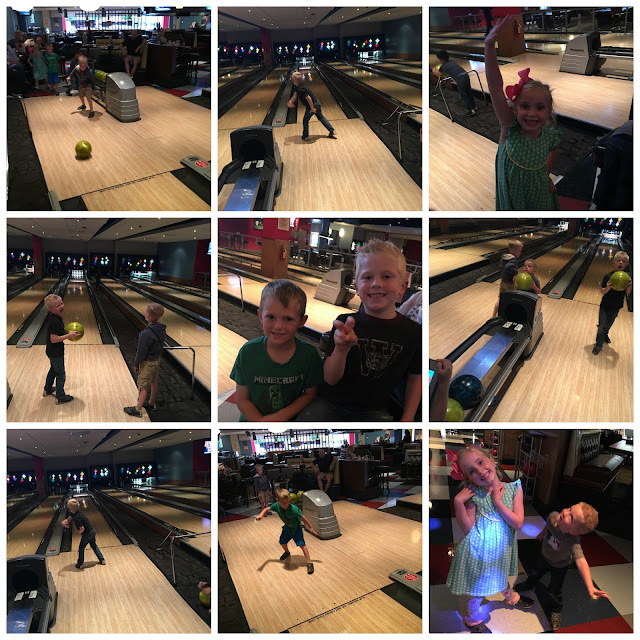 We swung by and picked up three of his good friends and headed to Splitsville for some bowling fun. M came to join the fun as well! We had pizza, nachos, and french fries with the most delicious french onion dipping sauce for dinner. Seriously, I might ask to go back for the fries and sauce on my birthday. We followed it up with baseball cupcakes for dessert. I sent this picture to all the mamas at the end of the night and let Meagan know I was signing Fount up for a bowling league. How we ended the night!! Nixon had the best time celebrating his big day with friends! What is your favorite fruit? "I don't really like fruit". What's your favorite book? "I don't really like to read books much." Smith had THE BEST time bowling for Nixon's birthday!! We just love Nixon so much and cannot wait until next year when we get to love on him and his dog :). What a great day for him!!! Such a fun birthday and cute pics! And FOUNT! WOWZA! Could you please share some details about the dog house toy (in the first photo) with the stuffed puppies? I think my little dog lover would go crazy for that, and her birthday is coming up! And I am with you on the dog thing! I am allergic so I have an excuse when the hubby (and kids when they are older) brings it up! Ha! I love bowling so much! I can't wait until our kids a little bit older so we can take them! Isn't his score crazy?! Haha! Looks like a great 6th birthday for Nixon! !